A good pre-shot routine will help make your swing more repeatable and your game much more consistent. Most people have a pre-shot routine regardless of whether they are conscious of it or not. A good pre-shot routine should be positive in nature – it should reinforce what you want to happen rather than what you want to avoid. If, as part of your pre-shot routine, you focus on hazards and where you don’t want the ball to go, it actually increases the chances of that poor shot happening. See this Thinking In Positives video for more details. 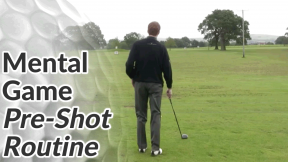 Stand behind your ball and find your ball-to-target line. Some golfers like to hold their club up horizontally so that it runs through the ball and straight to the target – as a visual reinforcement of the ball-to-target line. It can also help to pick out a patch of ground, or a leaf a few feet in front of the ball that sits on your ball-to-target line. Now, come into the side of the ball to make 2 practice swings. Even though these are practice swings, your stance and the alignment of your feet, hips and shoulders should running square to your ball-to-target line. 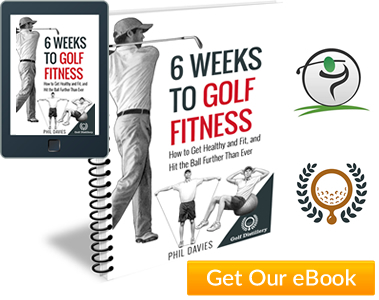 During the first practice swing, you can think about 1 or 2 technicalities in your swing. If you’re working on something specific, you can quickly remind yourself during this first rehearsal swing. 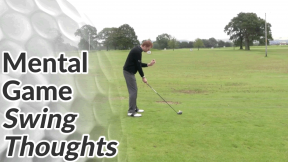 Take a second practice swing, but drop any technical thoughts from your mind. Just a feel for a nice smooth rhythm and tempo. Now go ahead and make your shot. As you set up to the golf ball, cross-check the alignment of your stance with your ball-to-target line and the patch of ground a few feet in front of the ball. During this swing, you must keep technical swing thoughts out of your mind. See this lesson for how you do that. 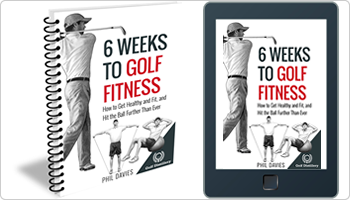 Should your pre- shot routine get interrupted (you get distracted by something in your environment or a negative thought), step away and start again at the very beginning – i.e. stand behind your ball and get your ball-to-target line etc. Side note I see a lot of golfers make a few ‘waggles’ with the club just before they hit their shot. This helps release tension but most waggles tend to be very wristy. 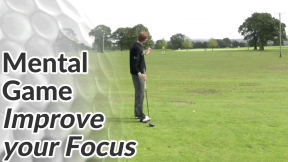 This then trains the brain to make a wristy takeaway or backswing instead of a nice one-piece takeaway. See the video above for a better class of waggle!